I built this version of "Big Daddy" Ed Roth's Road Agent from the re-released kit and another "Big Daddy" Don Garlits' rear engine dragster kit about 4 years ago. I just can't seem to build anything straight out of the box anymore and two of my favorite subjects are drag cars and show cars so the mix was inevitable. 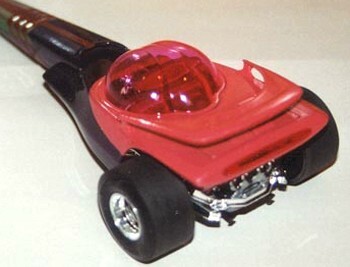 The car uses the Road Agent engine/rear end/front end and the extended body of the dragster. I also added a spoiler donated from a Firebird T/A. Car colors are florescent pink with clear pearl over coat, Boyd's Grape Pearl, Testors Green Pearl, Testors Ruby Red Metallic, and Testors Champagne Gold. Top coat is multiple layers of Testors High Gloss and as usual all paint are from heated spray bombs.